Little Green Junior School | Tag Rugby team win the Rickmansworth League!! 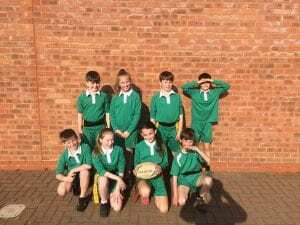 On Monday evening our Tag Rugby team took on Rickmansworth Park and Harvey Road to determine who would represent Rickmansworth at the Three Rivers Finals at St Joan of Arc School this coming Thursday. A very tight opening match against Rickmansworth Park saw two tries from Lara give us a vital three points in a 2-1 victory. The winning try being scored just seconds before the final whistle and was the result of some brilliant defensive discipline by the whole team! Our other match against Harvey road saw us win 5-1, defensively we pressed very high and Harvey Road could find no way past our line of defence. Two tries from Lara, plus one each from Ted, Micky and Grace saw us run out comfortable winners. Well done to the whole team and good luck for Thursday! What an amazing success! Remember how good that feels! Wow! What ambassadors for our school. Well done to you all.